Game division at Microsoft, presented the December list of free games for subscribers of the digital service Xbox Live Gold. In December, the owners of Xbox will not see in the list of projects Xbox Live Gold something particularly outstanding. Q. U. B. E. 2 (Xbox One c 1 to December 31). The continuation of a series of physical puzzles in the style of the cult game Portal. Never Alone (Xbox One - c of 16 December to 15 January). An adventure platformer in which a little eskimo girl Nan, moving through the story, you must solve puzzles, interact with his co - charming Fox. 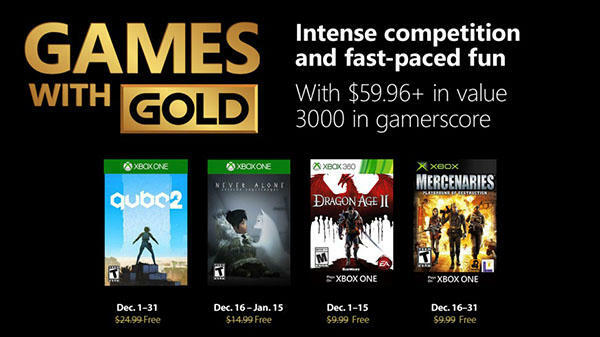 Dragon Age II (Xbox 360 c 1 to December 15). The most controversial part of the series of role-playing games Dragon Age, in which the player will hold the position of defender of the city Kirkwall. Mercenaries: Playground of Destruction (Xbox 360 c 16 to 30 December). The first part of the action-adventure series in the open world. Here, players will assume the role of one of three mercenaries to prevent a nuclear war. To do this, the hero is free to use firearms, as well as land, airspace and any other military equipment.